SALE! 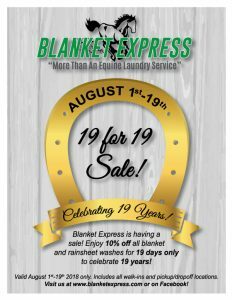 Blanket Express is celebrating 19 years! Blanket Express is having an Anniversary Summer Sale! PSSST!!!! Have you heard the rumors? Well, they’re TRUE!!! Blanket Express is having an Anniversary Summer Sale! 19 Days only to celebrate 19 years! Don’t miss your chance to save and be ready for the fall!! 10% off all blanket and rainsheet washes August 1st-19th, 2018. It’s hard to believe it’s been nearly 20 years since we first started in our barn! We outgrew our barn and moved into a new larger facility that also includes our Blanket Barn, where we have a large selection of new and used blankets for sale. You can view most of them here. We are now offering a lot more than just equine blanket washes, too! Blanket Express offers canine laundry, and additional towel services, too. Have something else you need washed? Call us and let us help provide a solution for you! 425.788.1494. Master your image with Embroidery by Blanket Express! Did you know we also offer full embroidery services? Yup! We not only do embroidery on blankets, but we also offer full service embroidery for apparel, jacket backs, team sports, corporate wear, gifts, and more! Don’t miss us at our new location just outside Monroe!